Todays online shopping extravaganza is courtesy of Britten Weddings and their absolutely gorgeous Art Deco Inspired ‘Circa’ 2013 collection. 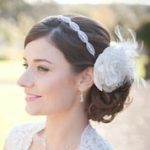 The collection ranges from elegant ostrich feather fans to intricately embellished headbands and all the pieces showcase the distinctive Britten style and fabulous craftsmanship. Since launching in 2011, Britten has created bespoke bridal accessories with a vintage twist. Each and every piece is handmade in the UK by head designer Sarah Jane Bates, who studied the art and craftsmanship of accessory design at London College of Fashion and now works with her team from their workshop just outside Bath. All pieces in the collection are available to buy online but if you have your mind set on something and just can’t find it anywhere Sarah says ” we can offer a fully bespoke service allowing you to work alongside the team to design your perfect piece”. So if you missed out on getting something gorgeous for Valentines Day (I for one was just glad for a bunch of flowers!) then go ahead and give yourself a little treat today!